One of the newest additions to the Kalispel Public Safety Department made an appearance at the Camas Center last Thursday. 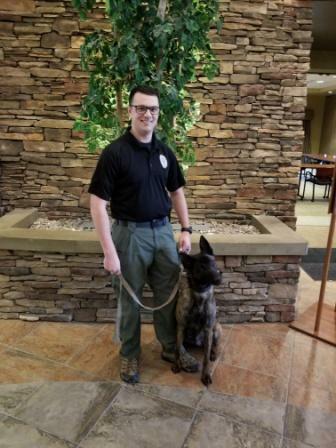 Along with Officer Clay Pierson, Brandy, a four year Dutch Shepherd/Belgian Malinois mix, came to the Camas Center to be part of the Public Safety’s monthly “Coffee with a Cop.” Officer Clay Pierson and Brandy make up the K9 Unit for the Kalispel Tribe and work together in Airway Heights. K9 Units are comprised of a law enforcement officer partnered with a highly trained canine. These specially trained dogs are chosen for their intelligence and strong sense of smell. When asked what it’s like to work with Brandy, Clay said, “It’s a blast. She’s a really fun and smart dog.” Since partnering with Clay, Brandy has been on two deployments, both successful. While Clay and Brandy spend the workday together they also share the same residence. “We’re together 24-7,” he said. Brandy is trained is narcotics detection and can sniff out methamphetamines, heroin, cocaine, and marijuana in many different types of environments. She recently received 200 hours of training at an Idaho post-certified narcotics detection canine school. The tandem is certified as a canine team in Washington State and Idaho. As those who have seen her in action know, Brandy is all business while on the job but she does have a playful side. While at the Camas Center she couldn’t help but bark once or twice at as kids from childcare rolled kickballs and threw Frisbees around the gym. Her favorite toy is a tennis ball after all. If Officer Pierson’s last name sounds familiar it’s because his father, Bret, is an Officer for the Tribe in Usk and has been for over six years. Clay has worked as a Police Officer for about three years and was a security guard at the Casino prior.